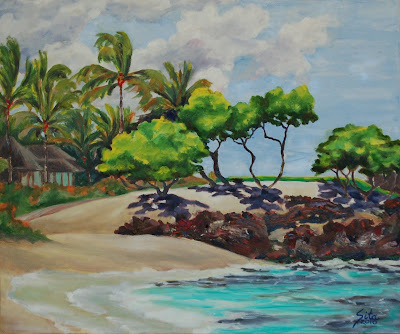 Artist's Comments: Below the 18th tee box at the Hualalai golf course is a wonderful little sandy beach where small waves lap up onto shore providing golfer's with a soothing sound as they tee off to the 18th hole. From the beach, there is a nice change in elevation looking up the hillside, over the 18th tee box, onto the residential homes and finally to a wonderful gathering of clouds. I experimented with a pallet knife on the skyline and was intrigued with how smooth the paint glided over the canvas. I am inspired to learn how to use the pallet knife and would like to find a class in this technique.